Welcome to Columbia Midtown Florist Blog Section. Here is where you'll find a monthly topic in relation to floral arrangements, tips, and advice on how to enhance your home with a great floral arrangement. We’ve all experienced the harshness of winter. Even layered, limbs go numb with the chill of Jack Frost crawling along you, runny nose, watery eyes, chapped skin and frozen toes. Now imagine facing these environmental factors with no clothes, no warm circulatory system and you can't move. Definitely not the best time for flowers or plants unless its a plant that thrives in the winter. Here are some tips on saving your beautiful delicacies in harsh cold weather. The summer plants tend to die during winter because of the intolerance towards the cold weather. You can always put in an effort to save them by removing their debris, taking them indoors or simply by covering them. Fallen leaves and dead plants can cause disease or pest growth. Dispose the waste appropriately or use it for compost or to develop manure. In winter, it is always a wise decision to incorporate the well-drained soil for a better winter home. In the fall, the heavy soil tends to be heavier because it freezes and defrosts. Winter brings cold chills with its arrival. Wrap your delicate shrubs like roses or tree peonies with paper or burlap (fabric made from jute) to protect them from the winter wind. QUICK TIP: Leaving the wrappings on until early spring can allow the plants to begin their growth before they are able to maintain it. Plants need sunlight to survive and grow. The delicate plants that you keep indoors require sunlight too. Expose the plants with proper sunlight. Keep them near windows or doors. You should prepare your plants in advance by spreading a new layer of mulch during winter. This technique helps to feed the plants in upcoming seasons. For the plants, containers can make or break their game. In chilly weather, the pots should be well insulated and should be able to resist the frost. We all love roses! With Valentine's Day right around the corner, you might want to pay close attention to this. These beautiful flowers need to be protected from the harsh cold weather for their survival. Provide proper care and attention to the plants to make it bloom into flowers. The indoor tropical plants which thrive for humidity should be provided with light mist for proper growth or maintenance. Weeds can grow even in the winter. For a clean and healthy growth for your garden, keep a consistent eye on weed growth. Control the weed using lawn equipment or hire a professional. Winter is here. Summer has come and gone and with it, it’s dazzling array of summer flowers. In this post, we will be discussing some of the amazing winter based floral arrangements that you can try this holiday season. You will be surprised to find more floral selections than you think. 1. Select your vase and choose gleaming metallic material to uplift the subtle colors of flowers or choose a wooden vase to give the authentic look. 2. Start with an ornamental plant which should seems to be covered with snow or should have a layer of white over it. The idea of choosing this type of plant is that it appears to be covered in the dust of snowflakes, which gives a beautiful effect that fits the theme. 3. To give the structure to the arrangement, add the sprigs of different plants, along with leaves of white pine if available. 4. Lastly, add some more leaves for depth to finish the look. For a decent and elegant look; this exclusively prepared floral arrangement will work the best. For this look, we will again start with some ornamental plants as a base for the touch of winter and include light pink king flower-rose and some crazy mauve colored blossoms. To break the soft touch, we will add some of the plant sprigs. Also, along with these, add little sheer cloth to the vase to enhance the floral beauty.The contrasting pink and mauve with the hint of green and white completes this delicate look. All-white floral arrangements express a sense of longevity. The simplicity and elegance can be achieved with beautiful white roses with a hint of some light pink selections. Add some more white flowers with blooming petals. Top it off with dusty miller for the perfect all white look. 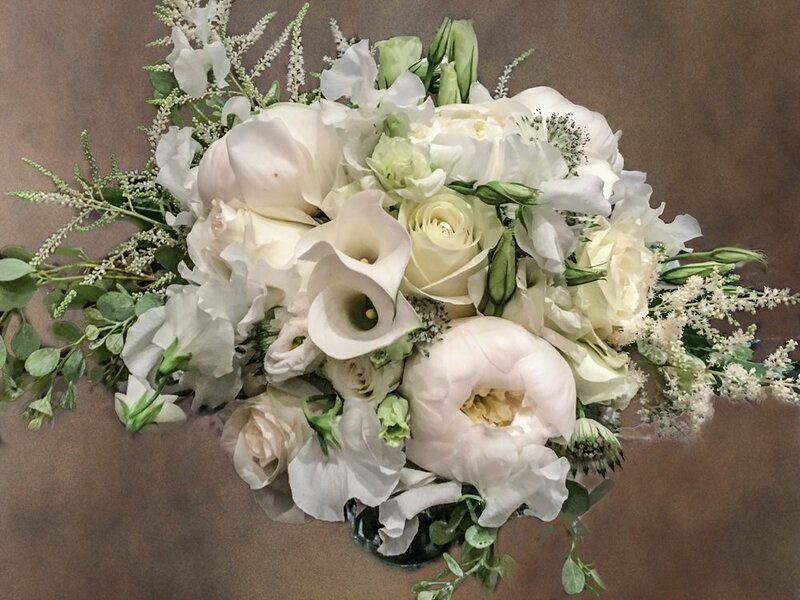 If you have wedding bells ringing this winter, get yourself this beautiful white colored theme bouquet/arrangement. With mesmerizing milky white roses wrapped in a white satin ribbon with some sprigs, you will get the ultimate wedding flower decoration. You can add a little colour with pink roses to break the monotony. It is easy to make and gives you a look which cannot go unnoticed for the attendees. This holiday, give your place a fun decoration with flowers which can be affordable and the best decoration you would ever have. Pure white roses and the cherry red berries popping out will make everyone go crazy foryourdecoration and help put them in the holiday spirit. Columbia Midtown Florist is your one stop shop for quality winter floral decorations. We have a wide range of floral bouquets, holiday collections and seasonal collections for events, weddings, funerals and corporate events or places. Regardless of the venue, you name it and we serve it. We are a family owned business based in New York City that has been around for many years. Visit us any time in our Manhattan location or you can order online at www.columbiamidtownflorist.com and get same day delivery in NYC. Thanksgiving is the time to celebrate and show gratitude for the good things in life. On this day of festivities, all family members gather and dine together. In the USA, this day is considered a major family celebration and is celebrated by family and friends and loved ones. A welcoming stage or a decorated dining table is always a good idea to enhance the enthusiasm in the air. A more well-known decoration, the floral centerpiece, has been a mainstay in the Thanksgiving tradition for many generations. So, why not let the professionals do the work for you? We, at Columbia Midtown Florist, are here to make your Thanksgiving a memorable one this season. With a variety of Autumn decor, the Fall flower arrangements have become popular these days. Learn why you should be focusing more on floral decor this Thanksgiving. Here are some reasons why floral decorations can make your event stand out. Flowers are the earthy and great way to say thank you! If you are the guest, you are a lucky one who didn’t spend the whole day stuck in the kitchen preparing what’s on the menu. Show some gratitude towards your host for all his hard work and love. Send a beautiful bouquet of orchids. The gorgeous flowers include a variety of fresh and pretty orchids of various vibrant colors to make anybody happy. This Thanksgiving, be appreciative by showing up with flowers. A great Thanksgiving is a feast for the eyes in itself. Placing a floral centerpiece will enhance your decoration go from nice to outstanding. You can always add colors and freshness all around with a bunch of floral decorations. Thanksgiving can be a stress booster: preparation of the feast, cleaning the mess, and the other chores; it can’t be more hectic. Floral arrangements can take away the turmoil and add edge, elegance, freshness and can be an effortless process. The Columbia Midtown Florists have a team of professionals who can take care of your floral decor problems. Start searching for flowers here. Columbia Midtown Florists are New York-based family owned business serving the people of Manhattan area for many years. We work for both private and corporate sectors. We decorate for events, parties, office interiors, weddings, funerals, etc. You name it, we do it. You can get 10% off using promo code ‘FALL’. We have a testimonial and related videos that you can view on our official website.